The last interesting thing Sean Penn did was get dumped by Charlize Theron, but there’s no need to worry about Penn, he seems to be over Theron and into El Chapo...or maybe Madonna, again. Here is the tale of Sean Penn’s very big weekend. Last night, Rolling Stone dropped Sean Penn’s interview with drug lord Joaquin (El Chapo) Guzman. The interview had happened recently, but to Sean Penn—a man—it might have felt like a lifetime ago. In October, Penn had climbed to the top of an unknown mountain, at the top was a jungle clearing. It was there that El Chapo waited for Sean Penn. There, in the clearing, Sean Penn and El Chapo guzzled tequila and ate tacos. They talked the way men do; about money and violence and Donald Trump. El Chapo loves his mom. He loves Donald Trump, too. There in the mountain clearing they could just be two men; not a celebrity and murderous drug lord. Sean Penn no doubt hurried home, his head pounding with creativity and inspiration, and wrote his draft in a drunken frenzy. It includes gems like this: “when I do journalism, I take no payment.” This is the kind of depth and insight one excepts from Sean Penn, a man. But maybe, maybe, Sean Penn’s interview wasn’t about journalism after all. Perhaps Sean Penn understood that the lure of El Chapo is just a thin veil woven with secrecy and violence, but beneath that veil is little more than death. So Sean Penn turned in El Chapo. Maybe he wept like a man when he did. With the thrill of adventure still pumping through his veins, Sean Penn coolly hosted a fundraiser for his Haiti charity. Asked to comment about El Chapo, Sean Penn responded, “I can’t.” But in the crush of flashing camera, Sean Penn grabbed onto the hand of Madonna, a warm, grounding hand. The hand of a woman. 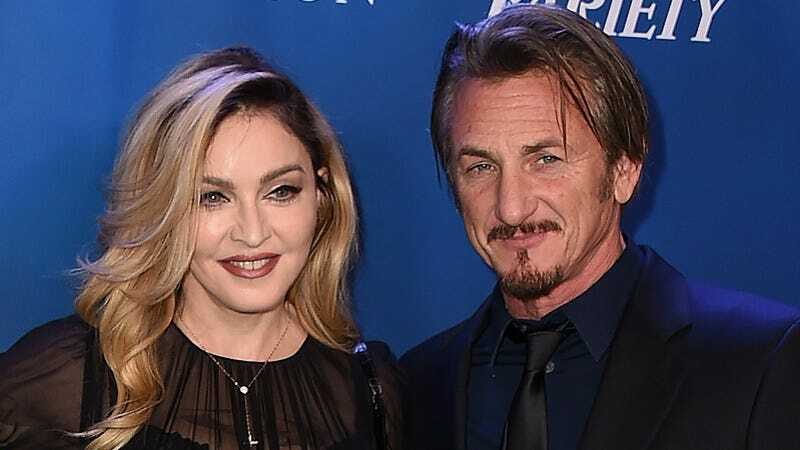 Maybe Madonna needed Sean Penn—a man—as much as he needed her. On the stage, she performed a French song with a ukelele. There was sadness in her eyes, the same sadness that had overwhelmed her a few days prior. On a stage in Mexico City, she had broken down and cried. “We all go through challenging times in our lives, and that includes me. I, too, go through challenging times in my life, and right now is one of them,” she said.